Mamma Vintage: I'm giving up . 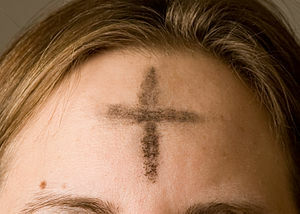 . .
Today is Ash Wednesday, the beginning of Lent. We will be going to Mass this morning bright and early at 8 am, even earlier than our Sunday 9am Mass that we usually go to. Wish us luck! When it comes to Lent, I have not been a very good Catholic (probably like a lot of people!). I don't think I have EVER given up something for Lent and really done it. It is not a tradition in our faith that I really relate to, or maybe more likely I've just never been disciplined enough. It seems when giving something up, most often we think of chocolates or desserts. As I really don't have a sweet tooth, for me this idea feels meaningless. Maybe I should give up salt! That would definitely be difficult for me. But even still, my mind asks why? How will this bring me closer to God? Perhaps the answer is simply that by making a small sacrifice in our daily life, we will be reminded of the ultimate sacrifice that Jesus made for us. I have never been good at sacrificing something just for the sake of giving it up. I want to grow. I want to learn. This is the first year that I have truly reflected on this and come up with a satisfying answer that makes sense to me. In fact, my almost seven-year-old son and I are going to try giving up the same thing. Doesn't that show just how mature I am? Joshua and I will both be giving up . . . (wait for it) . . . yelling. This is a very difficult task for both of us. He is a strong-willed child and while he does not yell as much as he used to, he still does on occasion. I actually pulled the car over and gave him a timeout on the side of the road for yelling at me a few weeks ago. Wonder where he gets it. Yep, I am a yeller. Like Joshua, I have gotten better over the years. My patience has grown and so have the tools that I draw from when dealing with my children. But I still yell. This is partially because I feel justified in yelling. As a parent, I feel there are appropriate times for yelling. But it is a slippery slope and yelling can become a habit, an instinctual reaction. When this happens, you know you are yelling too much and most likely your children have stopped listening. While I have worked on yelling less, I have never just given it up. This will be difficult. I will struggle. I sill definitely need God's help, which is why it is perfect for Lent. Are you a yeller? Do you have any advice to help me with my goal this Lent? This was a bad habit of mine too, until I trained myself to go to the other extreme. Parents tend to yell (at least, I did) to get the child's attention more than anything else—to make it impossible for them NOT to hear what's being said to them. Instead, whenever you feel the urge to yell, whisper instead. Human instinct, strengthened by natural childhood curiosity, will immediately silence the child while they strain to hear you. This was something I originally tried with a foster child I had years ago. It worked so well on that child that I began using it on my students. The successes with my students have continued, and I now use the trick on my own son too. I find, for myself, that it's also harder to remain genuinely angry while whispering. The act and volume of yelling seem to intensify my own anger AND the anger/hurt of the person being yelled at, while whispering seems to have the opposite effect. Another added benefit is that whispering can be done in public to control tantrums and behavior at the grocery store or a restaurant without drawing unwelcome attention upon yourselves! Good luck!